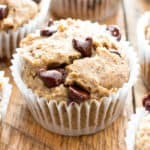 5 Ingredient Chocolate Chip Cookie Dough Bites Recipe (V, GF): a quick ‘n easy recipe for decadent no bake cookie dough bites made with healthy gluten free ingredients and PLENTY of chocolate!! Vegan, Gluten-Free, Dairy-Free, Refined Sugar-Free. Can you believe it’s been 16 months since I’ve shared a cookie dough recipe with you? It’s also been about 2 years since I shared my reader-favorite no bake chocolate chip cookie dough bites. 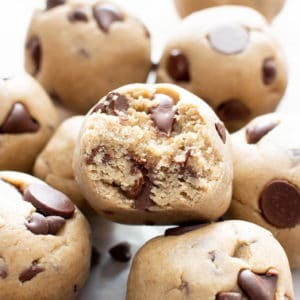 Update: I’ve since come to my senses (hehe) and shared this Dairy-Free Coconut Flour Cookie Dough Recipe and my Healthy Gluten Free Cookie Dough Bars! 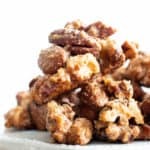 You could call those bites a cult favorite of sorts because I get emails/comments about them fairly frequently, but they never make it to the top 20 or even top 40 recipes of any given day. Poor guy! 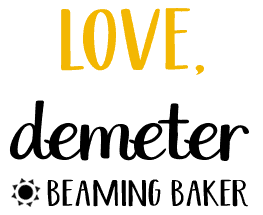 Although that recipe will always have a special place in my cookie jar heart (that didn’t sound as great as I thought it would hehe), it’s not quite on the level of simplicity and ease that you’ve come to know and love here at Beaming Baker. I’ve had so many requests and comments for how to swap that ingredient and this ingredient in that cookie dough recipe. 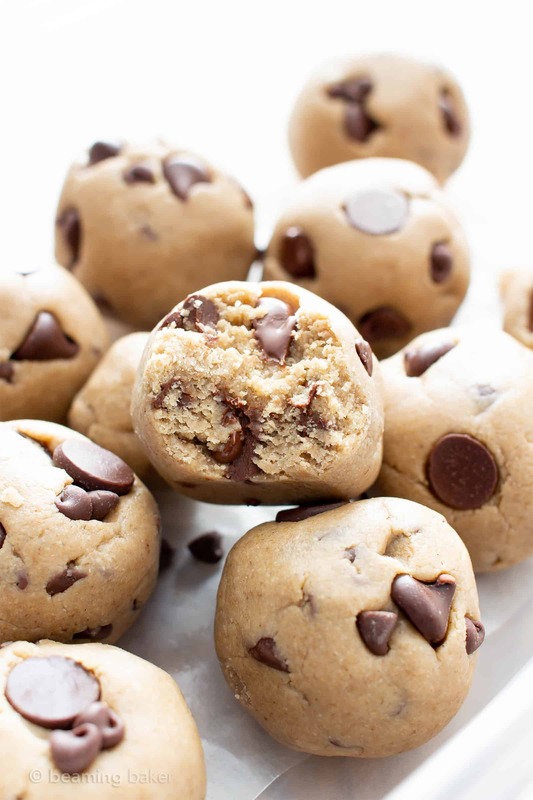 So I decided it was high time to create a brand-new, simple as can be, as few-ingredients-involved-as-possible 5 Ingredient Chocolate Chip Cookie Dough Bites recipe. The old cookie dough recipe called for 9 whopping ingredients. You had to make flax eggs, bust out rolled oats (which some people really did not love) and every-thang! This time, we’re gonna dial it down to just FIVE INGREDIENTS. You heard me right. 5 ingredients. That’s it. 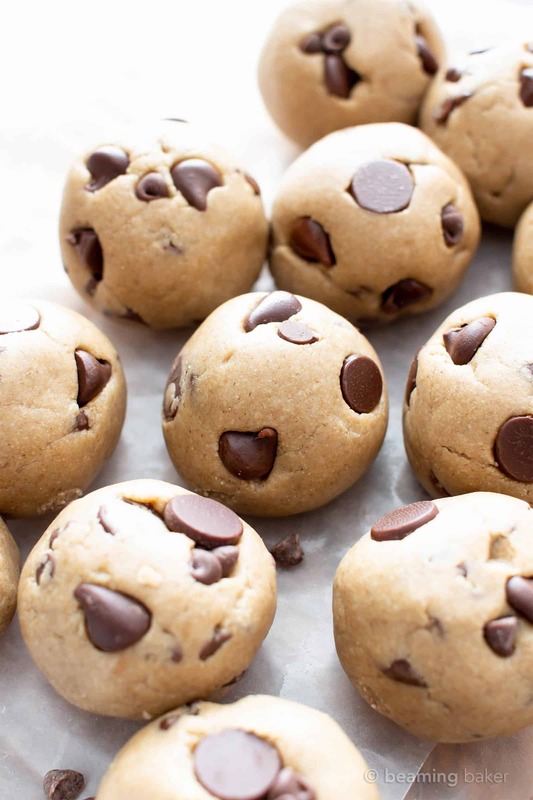 They’re so unbelievably easy to put together–possibly the easiest cookie dough bites recipe you’ll ever make. And they taste just like the real thing. All you have to do is throw all of the ingredients in a bowl, stir until thickened, scoop and roll into bites. Then, leave the bites for just a few minutes to thicken up. Oh, and you’ve GOT to try them warmed up after the first day. They get really firm after that… and it’s a problem easily solved by a few seconds in the microwave. They literally taste like perfectly under-baked, fresh-out-of-the-oven chocolate chip cookies. And speaking of no bake goodies that taste amazing when warmed up, you have got to try my No Bake Almond Butter Paleo Brownie Bites heated up for a few seconds. They taste just like fresh baked brownies! 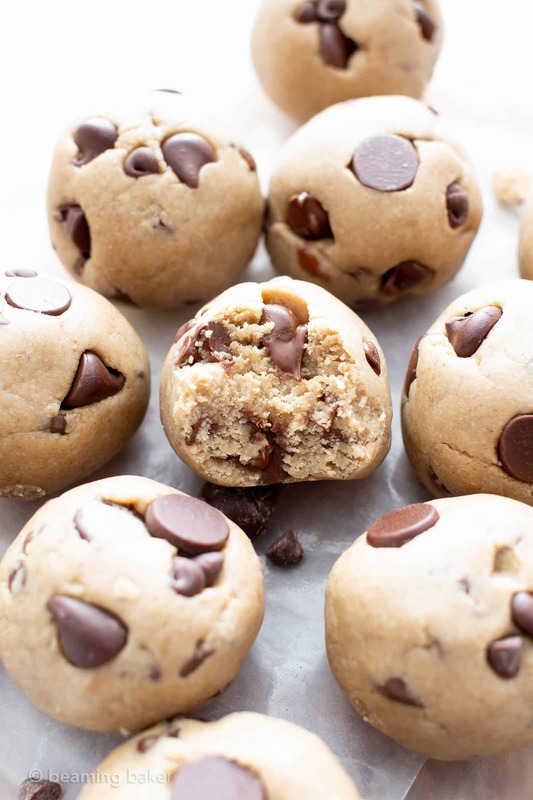 Or my brand new paleo cookie dough recipe: Paleo Cookie Dough Bites! Raise your hand if that sounds heavenly to you. the tastiest easy gluten free cookie dough you’ll find! Who’s ready to get their chocolate chip cookie dough bite on? 🙂 You get the maple syrup, I’ll grab/lug my 50-lb bin of gluten free oat flour over. 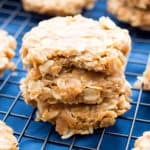 And in case you’re wondering, you can totally make your own at home, check it out here —> how to make homemade oat flour. As always, I’m so grateful that you’re here, sharing in these kitchen adventures with me. 🙂 I can’t wait to hear what you think of this recipe! 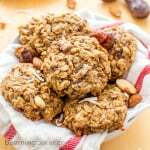 Chewy Healthy Oatmeal Chocolate Chip Cookies, just for fun! 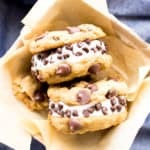 5 Ingredient Chocolate Chip Cookie Dough Bites Recipe (V, GF): a quick ‘n easy recipe for decadent no bake cookie dough bites made with healthy gluten free ingredients and PLENTY of chocolate!! Vegan, Gluten Free, Dairy Free. Add oat flour, maple syrup, oil and vanilla to a medium bowl. Using a spoon, stir until thickened and well incorporated. If needed, use a rubber spatula to fold together into a cohesive dough. Fold in ¼ cup + 2 tablespoons chocolate chips. Using a cookie scoop, scoop and drop balls of dough onto the prepared baking sheet. Here are the 1-tablespoon scoop and 2-tablespoon scoops that I use. Using your hands, shape into spheres, or keep as is if you like the shape. Optionally, dot with 2 tablespoons chocolate chips. Allow to firm up for about 5 minutes. Enjoy! Storing instructions below. 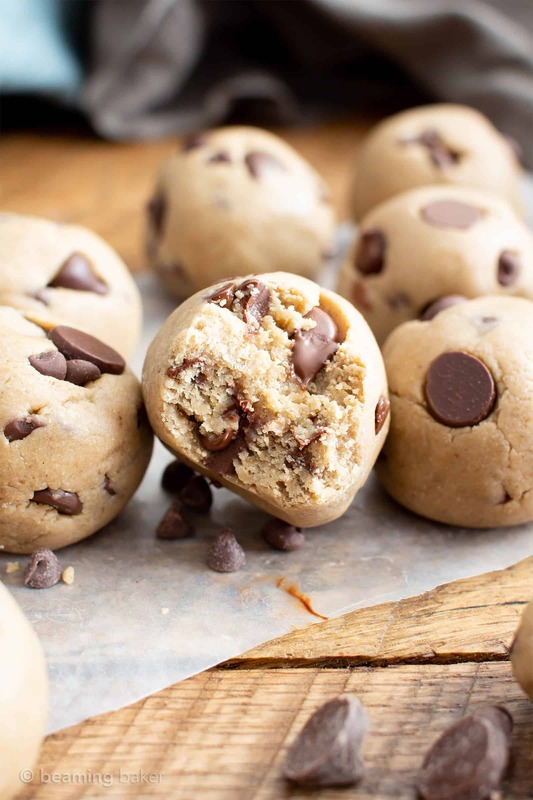 Looking for more cookie dough treats? 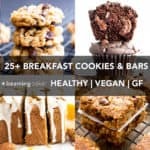 Try my Paleo Cookie Dough Bites and my Vegan Chocolate Chip Cookies Recipe. - Best if enjoyed the first day; Day 2 and on, the bites will become much drier. Day 2 and forward, to soften, heat in 10-second increments in the microwave until warm. - Store for 1-2 weeks in an airtight container at room temperature or in the refrigerator. 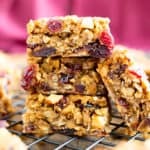 I am going to get everything today to make these I know my grandson will go nuts over these how brilliant and healthy! I am going to bookmark this recipe. I am a diabetic so this is right up my alley. Thank you so much. I think you’re really going to enjoy these bites Molly. 🙂 Can’t wait to hear what you think! Haha yes! These are perfect for combating those ever present cookie dough emergencies! ???? You know it Cindy! Quick and easy, just like it should be. ???? Could you sub almond flour do you think? Cookie dough! Yes! And one you don’t have to feel bad about too! Oooooh I’m SO excited to make these!!! My mouth is totally watering just thinkin about them!!! Oh. My. YUMMINESS!! I don’t know how I survived the 5-minute wait while these set! I ate a lot of the dough for the cookie dough… the cookie dough-dough? Anyhow, these tasted like a DREAM and my family ate them so quickly that it was probably a record! Hehe!!!! I’m seriously LOVING your comment!! 🙂 So pleased that you and your family enjoyed them. Happy no baking!! ???? Yum! Such a perfect snack! You got that right Jamielyn! Yep! Not need to turn on the oven at all. ???? I LOVE cookie dough bites! These look incredible and so delicious! Haha yes! Aren’t they just the tastiest snack? ???? I am going to make these for my son’s birthday party this weekend! Oh that’s wonderful Allyson! Wish him a very happy birthday for me! ???? I love how easy these are! I have to try them asap! Yes! Cookie dough ice cream is definitely the best! ???? Awesome! Hope you enjoy Erin! This looks really good! My kids will surely ask for another batch! Can you use coconut flour instead? Hi Amanda! Coconut flour is much more absorbent than oat flour, so it would end up being much more dry. Hope this helps! I am looking forward to playing around with this recipe! Hi Jen! I’m so glad that you enjoyed my recipe. 🙂 I really tried to use as little maple syrup as possible, so I’m happy to hear that it was sweet enough for you! Thanks for calculating the nutrition facts and sharing. Enjoy! This recipe looks so perfect and easy! I have a dairy allergy in my classroom and since we cook a lot I’m always looking for vegan recipes so she won’t be left out. For one of our activities, we use cookie cutters to make hand shaped cookies. Do you think the consistency would be ok to do that with this recipe? Thanks for any tips! Thanks Michelle! 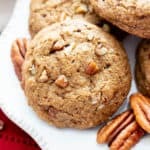 This recipe is a bit soft when it’s first made, but if you drop the “dough” into the cookie cutters and press it down into the shape, then chill them a bit, it’ll firm up. Hope everyone enjoys! Is the coconut oil necessary? Is it safe and healthy to eat raw oat flour? I am pregnant and my daughter is constipated (sorry, TMI) so I don’t want to make it worse for her (or for me). I made them with regular butter since I didn’t have coconut oil and they were soooo delicious. I made them for my daughter but I was tempted to eat them all in the process. Thank you. I would try your other recipes. These were YUMMY. Bonus: A quick recipe for a quick fix too. I added a sprinkle of kosher salt after rolling (as I love salted chocolate, salted caramel…so why not). We loved it. Thank you for the recipe! Ooh that does sound good! ???? So happy you all enjoyed the recipe Katie! 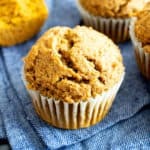 Any suggestions for how you’d modify the recipe if you were planning to eat them several days later (“Best if enjoyed the first day; Day 2 and on, the bites will become much drier.”)? Thinking about making these for a camping trip, where reheating won’t be an option. Thanks! Hi Nick! Try leaving out a couple tablespoons of oat flour. It’ll be a bit too soft the first day, and they’ll firm up over the next few days. 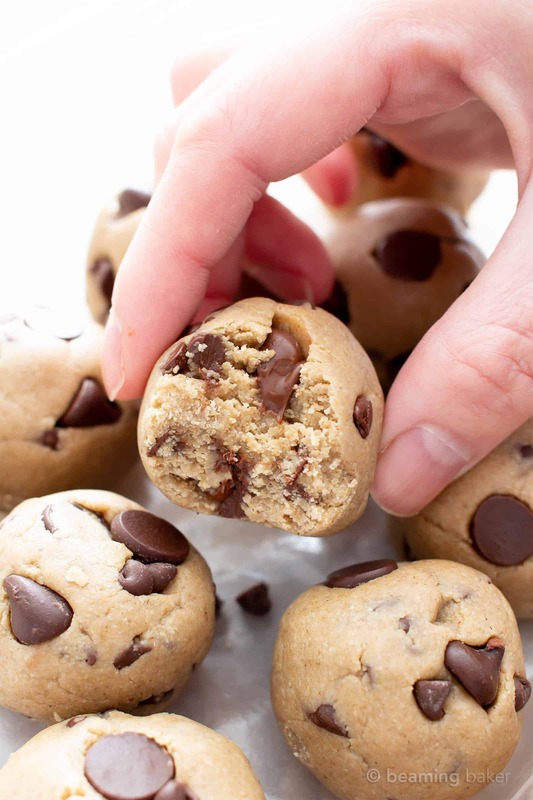 Or, try my Paleo Cookie Dough Bites–they stay soft for 1 week. 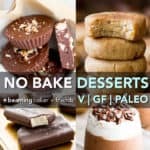 https://beamingbaker.com/paleo-cookie-dough-bites-vegan-gluten-free-grain-free-only-6-ingredients/ Enjoy! Hi Laura! Yes, it’s possible. Just do the following to ensure it’s safe to eat (kill bacteria): spread flour on a baking sheet in a thin, even layer. Bake at 350F for 5-7 mins. Then, use in the recipe enjoy! how many 1TB balls does this make and what can I substitute for maple syrup? How many dates would be substitute OR how much liquid stevia would be substitute? Please help, I want to try soon! Also, Can I replace chickpeas for the oat flour?